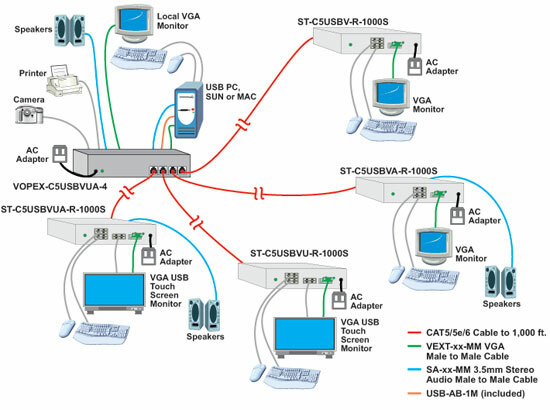 The VOPEX VGA USB KVM Splitter/Extender system has two components: the VOPEX-C5USBVUA-x broadcast unit (sold separately), which connects to a computer and provides local keyboard, monitor and mouse connections; and an XTENDEX� ST-C5USBVA-R-1000S remote unit for each remote monitor, keyboard, and mouse. The units are interconnected by CAT5/5e/6 cable. For additional remote USB port support please see VOPEX-C5USBVUA-4 / VOPEX-C5USBVUA-8 (local extender) and ST-C5USBVUA-R-1000S (remote unit), see also related products.